We are less than a week away from Opening Day and the winter seems to have finally faded away – though here in Kansas City we got one last blast of snow less than two weeks ago. No matter now, as the grass at Kauffman Stadium is green; workers are all busy getting the ballpark ready (including putting the finishing touches on the new Strouds location adjacent to the Royals Hall of Fame – Mmmmmm cinnamon rolls); and the boys in blue are finishing up down in Surprise. For baseball fans Opening Day is one of the most anticipated events of the year. In some cases it has nearly become a local holiday which is true in Kansas City at least back to 1985 when Opening Day sellout crowds have become an annual tradition (with the one exception of 1995). 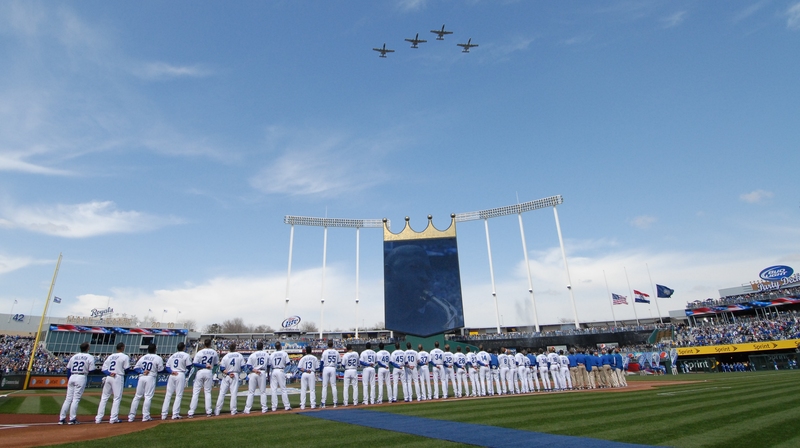 The 2010 season continues that line and, if the forecast holds, it looks to be a spectacular spring day for 40,000 fans to welcome home the Royals for another year of Major League Baseball in Kansas City. Trivia Question(s): Three parter here – if you get the trifecta you are truly a Royals expert. What year did George Brett make his first Opening Day start? Where in the order did he bat? Who hit just in front of him? Did You Know? : Only three times in Major League Baseball history has a player recorded three (3) home runs on Opening Day. Unfortunately on two of those ocassions it was against the Royals. Reigning American League MVP George Bell of the Toronto Blue Jays had three against Bret Saberhagen at Royals Stadium on April 4, 1988. The Royals lost 5-3. (Very bad day for me – later that night the Jayhawks beat my Sooners for the NCAA Basketball Championship and it still hurts 22 years later). On April 4, 2005 Dmitri Young of the Tigers had three against the Royals at Commerica Park in Detroit – two aginst Jose Lima and a third off Mike MacDougal. The only time the feat has happened in the National League also has a Royals connection. Former Kansas City farmhand Karl ‘Tuffy’ Rhodes blasted three home runs off Dwight Gooden of the New York Mets on April 4, 1994 – but his Cubs still lost the game 12-8 at Wrigley Field in Chicago (its must have been a windy day at the friendly confines). Trivia Answer(s): George was in the Royals Opening Day Lineup for the first time on April 7, 1975 against the Angels at Anaheim Stadium. He batted sixth and went 1-3 in the Royals tough 3-2 loss (the Angels rallied for two runs in the bottom of the ninth). His fellow future National Baseball Hall of Fame Member Harmon Killebrew was the Royals DH and was in the five hole.